Historically, the bow and arrow were fundamental to the survival of the Plains First People. This encounter for survival reflects out young people's struggle to cope in an ever-changing technological world where education is key. For centuries Aboriginal people have used the four directions of the medicine wheel, reflecting the cycles in native philosophy, as a tool for teaching and learning. The number four has sacred meanings that reflect the four winds, four seasons, four peoples of the world, four groups of living organisms, and the four elements. The four directions symbolize wholeness in the four stages of life's journey. The first quadrant in the east refers to the physical birth of our being. The south symbolizes adolescence and the exploration of new experiences. The west symbolizes adulthood and its challenges. The north symbolizes life's final phase that manifests all wisdom and spirituality. The medicine wheel and four directions reflect the positive force in life relating to Mother Earth. A community, working together in balance with the earth's cycles, will function in harmony. Traveling the four directions will lead to a destination that both challenges and rewards. 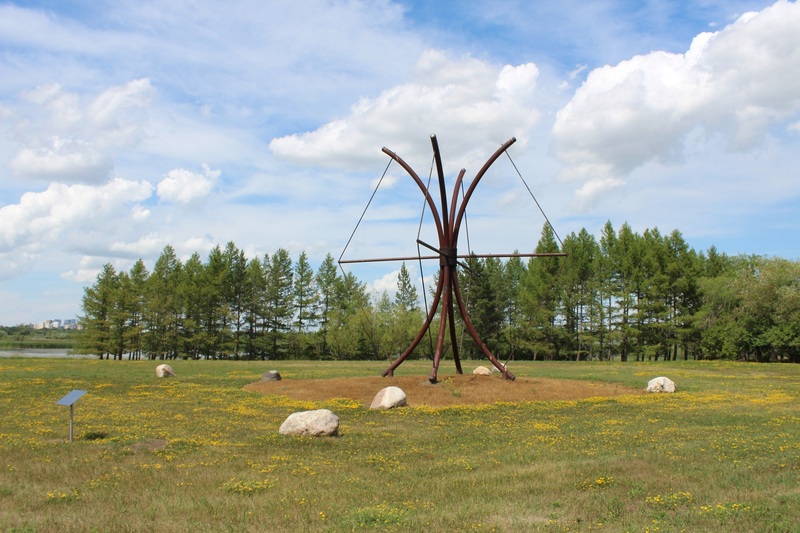 Unveiled in 2005, Four Directions was created by Lionel Peyachew, a Cree artist from the Red Pheasant First Nation in Saskatchewan. This sculpture was realized by the University of Regina and the First Nations University of Canada, in collaboration with the City of Regina, with the financial support of the Government of Canada through the Cultural Capitals of Canada, a program of the Department of Canadian Heritage. Additional support was provided by SaskCulture Centennial Project Fund, Saskatchewan Department of Culture, Youth and Recreation Community Initiative Fund, The University of Regina Alumni Association and Knowhere Productions Inc.